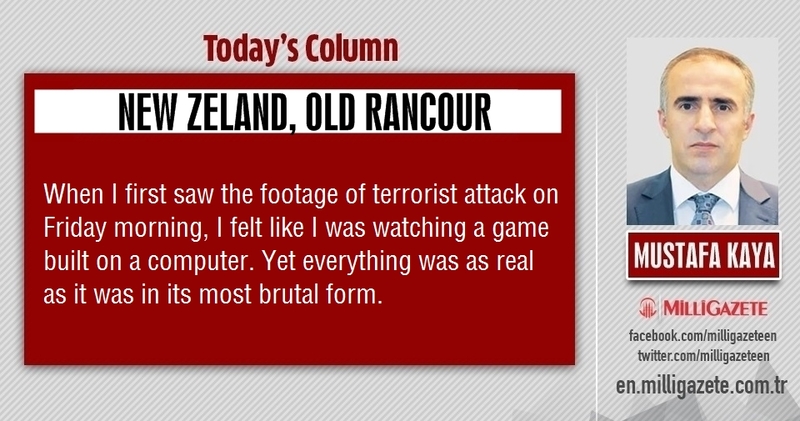 Mustafa Kaya: "new Zeland, Old Rancour"
›Mustafa Kaya: "New Zeland, old rancour"
Milli Gazete columnist Mustafa Kaya writes on Terrorist attack on Mosques in New Zeland. Here is the full article. When I first saw the footage on the Friday morning, I felt like I was watching a game built on a computer. But everything was as real as it was in its most pitiless and brutal form. The massacres of Muslims who came together in two different mosques for the Friday Prayer have caused a brief jolt in the world agenda. 49 Muslims were martyred in the attacks. The first reactions were replaced by a sneaky silence. Unfortunately, the ones who set the thames on fire when an attack is held in West, did not react for the massacre in New Zealand as it should be. Already, everyone knows that the racism in West have increased for a long time. Trump’s views on refugees and especially asylum-seekers are clear. If he can, he won’t leave even one refugee in the US. There are always refugees at the center of election campaignes. The European right is getting more and more effective day by day. The results of past 15- 20 years show us this. Breivik in Norway already had massacres with th e idea of waking up his own community. Let us indicate that; the terror has no religion,language, race, denomination. Terror is a crime against humanity regardless of who it comes from and against who. But, we must also ask. Why do the ones who set the thames on fire in the Charlie Hebdo attack act so quiet and swallowed up against New Zealand? Why are they in a double-standart manner? Because the aggressive terrorist emphasizes Hagia Sophia. He is using the revenge discourses against 1453. In other words, it speaks to the subconscious of the West world. And when they look at Turkey, they read what happened today according to the history by assessing the Islamic world. And these looks are being effective in the decisions they make. That’s why, they pretend to see the New Zealand but they don’t actually. On the other hand, this massacre requires Muslims to take their heads between their two hands and think immediately. There are also those who migrate to this land which could be considered as the far end of the world because of not living safely among the martyrs. Why did these people have to go there? Why are the Islamic lands focus of the constant conflicts? How can the terrorist organizations established by Western intelligence services find environments that can move comfortably in the Islamic geography? First of all, we must be able to answer all these questions. As a result, everyone should note this in bold. The current international system will never be able to bring peace and concord to humanity. Racist imperialism is the common enemy of humanity. At first, Muslims have to make their land safe. Especially after the Crusades, even if the bitter experiences we have been experiencing for the last 300 years are not enough for the awakening of the Islamic world, what kind of disasters, massacres, terrorist attacks are being expected, I really wonder. Don’t we see that all opprosed people, regardless of religion, language, race, denomination moan under the siege of imperialist focuses. How long do we wait to stop them, to stop the sheding blood, to relieve the tears?